While I was browsing volumes in the Rare Book Room recently I came across an early book of Virginia law, the Collection of All Such Public Acts of the General Assembly and Ordinances of the Conventions of Virginia, published in Richmond by Thomas Nicholson and William Prentiss, 1785. Opening the cover I could see that this particular book has an interesting provenance history. The bookplate showed that this book had once belonged to a Morgantown attorney, Alpheus P. Willson. The inscription at the top of the pastedown reads: “Presented to the West Virginia Historical Society, Nov 8, 1870, L.S. Hough.” Another Morgantown attorney, Hough was known locally as a collector of rare books as well as law books. The West Virginia Historical Society may well be the Monongalia Historical Society that operates in Morgantown today. The second bookplate, marked West Virginia University Libraries, shows that this book was donated in 1933 by A.P. Willson’s son, also named A.P. Wilson, though he chose to spell the family name without the extra “l” his father used. “Base of Perito Moreno glacier outside El Calafate, Argentina” by Ben Silverberg. Last fall, West Virginia University Libraries, in collaboration with the Health Sciences Center, launched “Art & Health: Artwork by Health Care Professionals at WVU,” which features two- and three-dimensional art by people who work in healthcare industries at WVU. Visitors were invited to submit written responses to the artwork as part of a corresponding contest, and the winners are students Jordan Niedoba and Carin Kuhn. 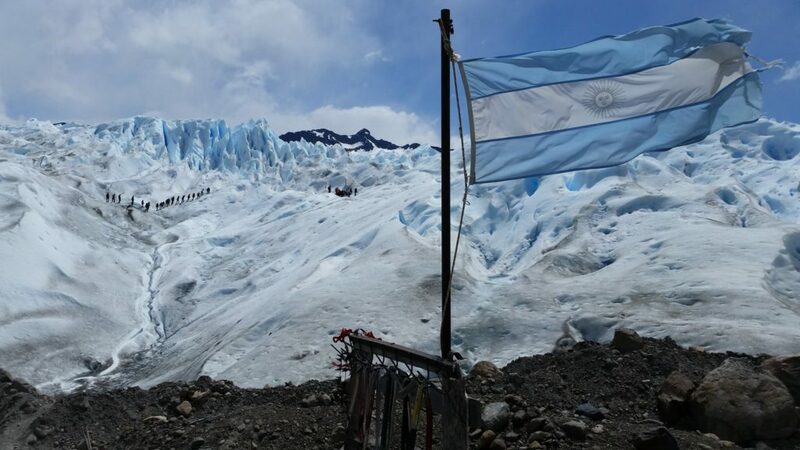 Niedoba finished first with her response to “Base of Perito Moreno glacier outside El Calafate, Argentina” by Ben Silverberg. In her submission, Niedoba explained that she was captivated by Silverberg’s photograph of a glacier in Argentina because it made her think about people choosing to climb the glacier despite the difficulty. She compared the climbers and their tenacity to patients at WVU Medicine, specifically the ones participating in the Narrative Medicine project. President E. Gordon Gee is known nationwide for his bow tie style, with feature articles and interviews in fashion publications Bow Tie Aficionado and Ivy Style, among bow tie mentions in national media such as USA Today and the New York Times, and regional media as well. He’s made several videos about his famous collection that began at age 16, and developed while he was President at WVU the first time, 1981-1985. One of his thousands of ties has flown to space. He’s met past US Presidents in them and made a plethora of service visits in them. People have imitated his style and Ohio State University even created an individualized mascot sculpture—“Gordon Gee Brutus”—donning his tie. Folks gift him with handmade ties and objects—funky and precious objects he holds dear. 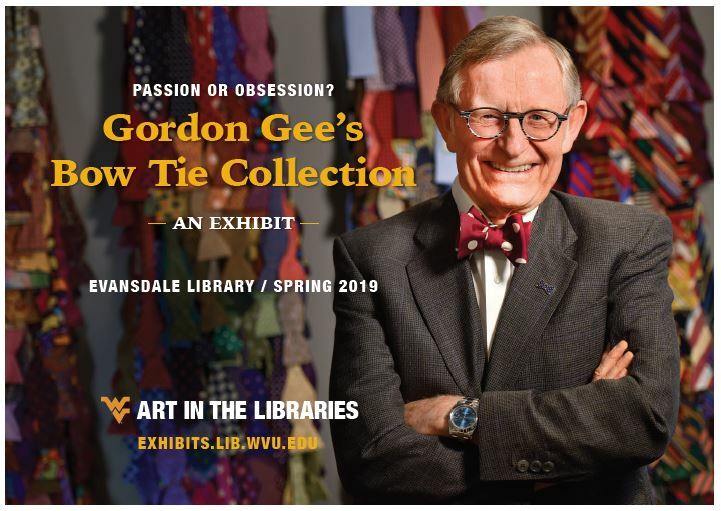 This exhibit, which run January 20-May 15, takes a look at his collection and some notable times where he and his notable ties were worn and honored, with a selection of his ties, photographs and personal objects. A reception with President Gee will be held Feb. 6 from 5-6 p.m.
West Virginia University Libraries and the Teaching and Learning Commons (TLC) are partnering to support the use of and the development of Open Educational Resources (OER) through a grant program for instructors. The grant’s aim is to encourage development of alternatives to high-cost textbooks, lower the cost of college attendance for students, and support faculty who wish to implement new pedagogical models for classroom instruction. 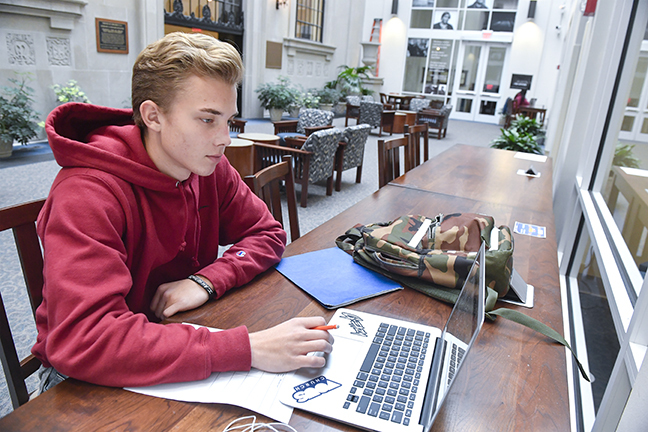 “Textbook affordability is a very real issue for many students, and we’re excited to see WVU supporting instructors in offering low-cost, or no cost, options for our students. There is a wide variety of high-quality, free resources available for faculty to consider and we look forward to partnering on these projects from a teaching and learning perspective.” Dr. Keith Bailey, assistant provost for Teaching and Learning and dean of WVU Online. 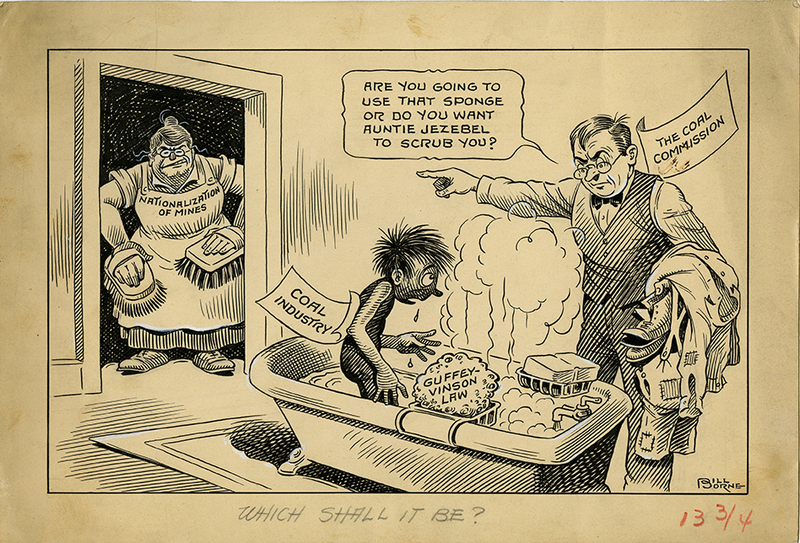 A cartoon commentary from the 1930s on the coal industry and coal commission, from the Rush Dew Holt Collection at the West Virginia and Regional Center. Although Virginia split into two separate states in 1863, West Virginia University Libraries and organizations from Virginia are uniting as part of the Digital Public Library of America’s (DPLA) new Digital Virginias service hub. Digital Virginias, consisting of institutions from both Virginia and West Virginia, offers more than 58,000 items from historical and cultural collections for research and exploration. Read more about the service hub, including how to get involved, at digitalvirginias.org. The cost of textbooks is rising at a rate of four times inflation. Sixty percent of students have delayed purchasing textbooks until they’ve received their financial aid. 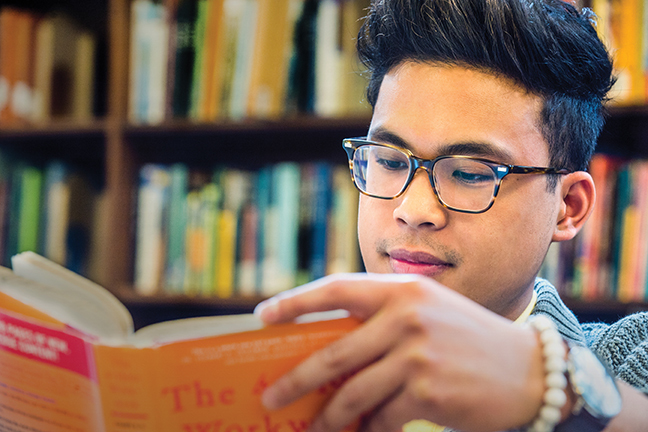 Seventy percent don’t purchase a required textbook during their academic career because of cost. Are you an instructor who is concerned about the impact of high textbook costs for your students’ academic success? You can help by attending the Open Textbook Workshop and Textbook Review where you can discover open textbooks in your field. After the workshop, you will be asked to write a short review of an open textbook. Your review will benefit other faculty considering open textbooks. You’ll receive a $200 stipend for your participation and a written review. The workshop will be held March 7 at 10 a.m. in Downtown Campus Library, Room 104. Librarians Hilary Fredette and Martha Yancey will lead the workshop. The first few lines of Stopping by Woods on a Snowy Evening, by poet Robert Frost, pictured below. One of the great masterworks now entered into the public domain. 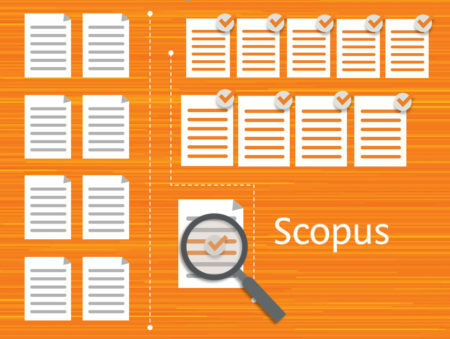 West Virginia University Libraries has reinstated its subscription to Scopus, a popular scholarly search tool. Currently the largest curated abstract and citation database of peer-reviewed literature, it includes the fields of science, technology, medicine, social sciences, and arts and humanities. It can be accessed on the Libraries website. Additionally, Interlibrary Loan continues to be a tremendous service for acquiring content necessary for research at WVU. In many cases, journal articles can be supplied within hours of the request. There is never a cost to the researcher or the department for obtaining materials through ILL. Liaison librarians are happy to meet with individuals or departments to discuss library resources and research needs. In November, the Art in the Libraries Committee awarded College of Creative Arts students Jacqueline Circkirillo and Cancan Huang with the Dean of the Libraries’ arts awards. 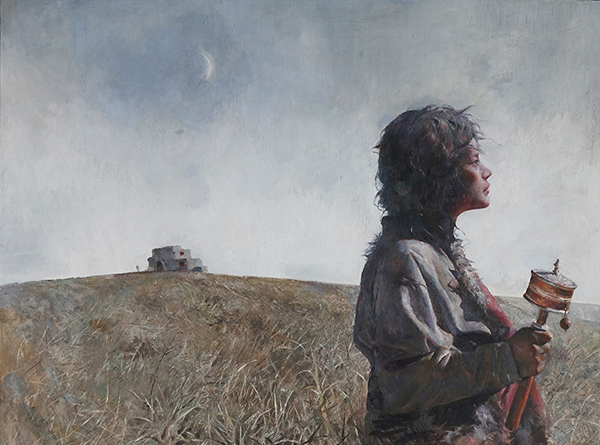 Huang’s work, Dolma, an oil painting, will be on display in the Downtown Campus Library lobby for the spring semester. 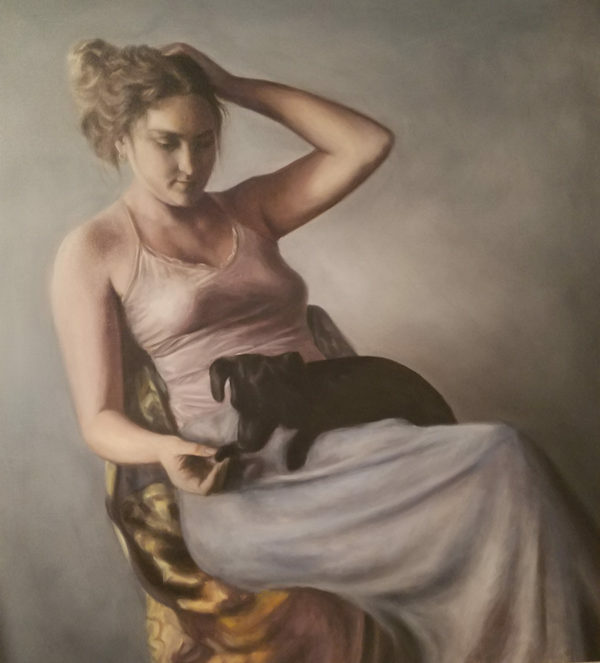 Circkirillo’s work, Margaret, an oil painting, will go on display at Evansdale Library for the spring semester. Blog post by Jane Metters LaBarbara, Assistant Curator, WVRHC. Family papers are a relatively common sight in archives like the WVRHC. We collect them because they tell the stories of the people of our state and region, and because they can be great genealogical resources. The WVRHC has hundreds of collections of family papers, ranging from collections with just a few items to collections like the Siler Family Papers, which contain over 150 boxes of material. I’m currently processing the Orum, Eskey, and McCaffery Family Papers, detailing intersecting family lines from Sherrard, WV, and I wanted to share a few items from the collection that I found particularly special. 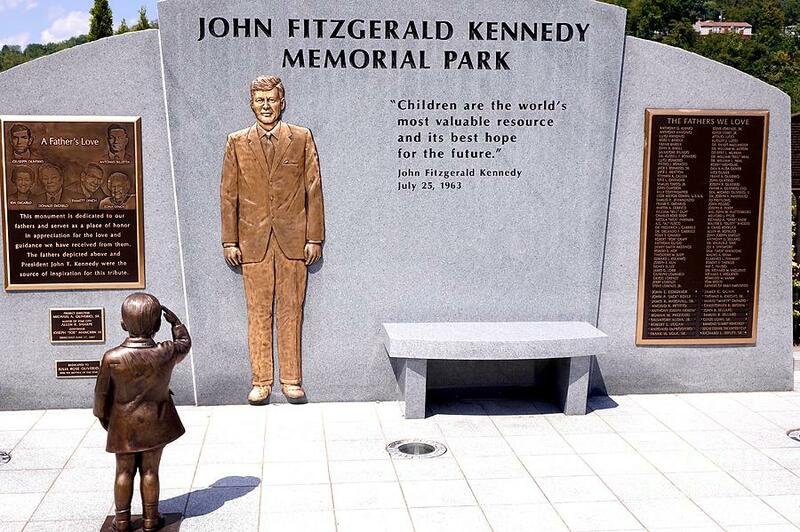 Do you know about the John F. Kennedy Memorial in Star City? Did you know the large Coca-Cola mural on a High Street building is a restoration originally painted in 1953? These sites are just two of the 44 local attractions detailed in the new Morgantown Public Art Guide, a collaborative initiative among WestVirginia University Libraries, the Greater MorgantownConvention and Visitors Bureau, the Art Museum of WVU, College ofCreative Arts, Arts Monongahela, andtheclio.com,a free nonprofit website that lists historic and cultural sites across theUnited States. From outdoor sculptures and murals to indoor galleries and venues, Morgantown offers many opportunities for experiencing art for free. 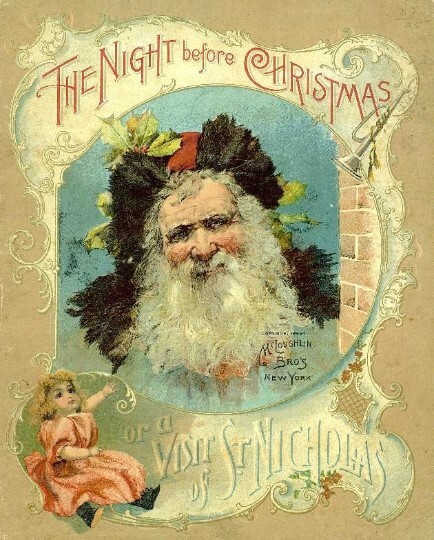 Blog post by Anna Schein, Associate Curator for Printed Ephemera, WVRHC. McLoughlin Brothers, Inc. was a New York publishing firm which pioneered the use of color printing technologies in children’s books. Actively publishing between 1858 and 1920, the company was particularly well known for its early use of hand-stenciled colored illustrations and its later printing techniques using chromolithographs and photo engravings. The company flourished under the leadership of John McLoughlin, Jr., who learned wood engraving and printing while working for Elton & Co., a publishing company owned by his father, John McLoughlin, Sr., and engraver/printer, Robert H. Elton. After McLoughlin, Sr. and Elton retired, John, Jr. had control of the business. He started to publish picture books under his own name and made his younger brother, Edmund McLoughlin, a partner in 1855. Recently the West Virginia and Regional History Center received the gift of hundreds of cookbooks that are part of the Lucinda Ebersole Collection. Ms. Ebersole was bookstore co-owner, cookbook enthusiast, editor, and book collector. 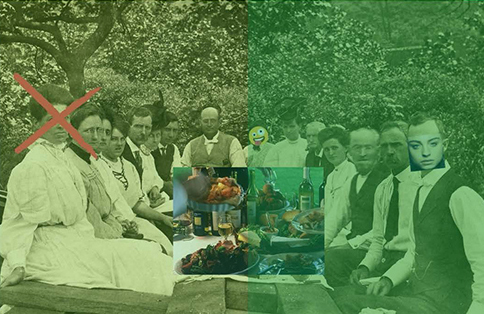 Her collection of cookbooks spans the late nineteenth century up to 2016. The much beloved cookbook pictured here arrived as part of the larger Ebersole collection. 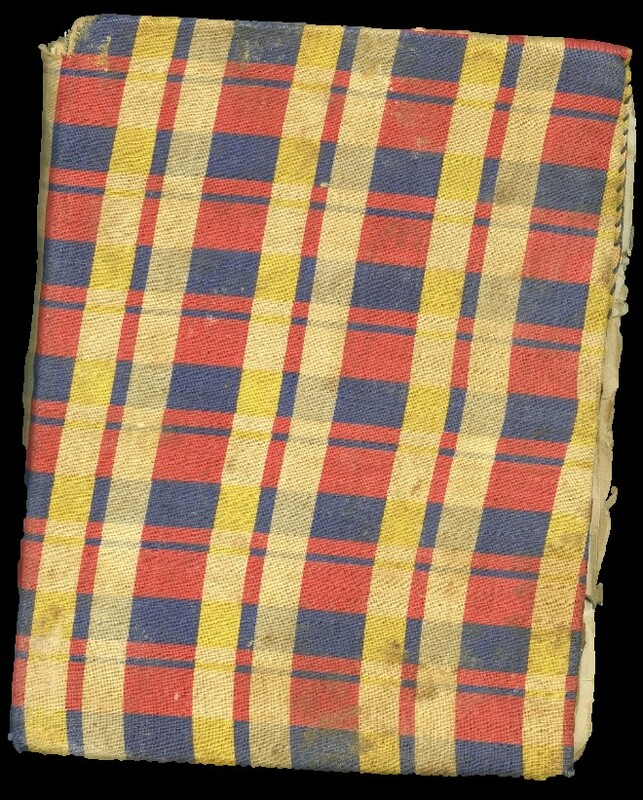 Beneath the hand sewn plaid cover is the Rumford Complete Cook Book printed in 1918. Nearly every page is covered with handwritten recipes, cooking spills and splashes marking favorite recipes, clippings pasted on pages that completely cover the text and recipes attached by paperclips. For two years now, West Virginia University Libraries has been working toward bringing our materials spending in line with the new budget realities that we have faced since 2016. One of the biggest challenges in our reduction in funds is managing “bundled” journals subscriptions that historically provided us with more journal title subscriptions at less cost. Unfortunately, over time the inflationary costs of these bundle subscriptions have outpaced the size of our budget. In 2016, when we were first presented with the need to reduce our spending, bundled journal packages accounted for 30 percent of our materials budget but only provided 6.2 percent of our titles. We recognized at the time that we would have to address this significant portion of our budget to achieve the necessary savings. We did so immediately by unbundling our Wiley subscription package which provided us with about $400,000 in savings at that time. Now we are moving to unbundle the remaining packages. Our librarians have spent the last year and a half doing a tremendous amount of analysis on our bundled packages. We have looked at where there is title overlap between different packages we purchase. We have purchased a detailed report that helps us understand which journals our campus researchers are downloading from, publishing in, and citing in their published research. Based on that we have been able to rank in importance the journals for our community in a data driven manner. Our internal collections advisory committee has reviewed and adjusted this work based on extra knowledge gleaned from relationships they have developed with colleges across campus. 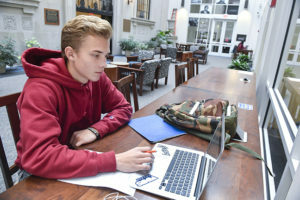 The WVU Libraries’ Arts in the Libraries Committee is seeking content from scholars, artists, community groups and practitioners from a range of fields to integrate into a curated exhibition that will be designed and installed in WVU’s Downtown Campus Library in the spring and summer of 2019, and potentially travel throughout the state. “This collaborative, multidisciplinary exhibit and programming will address the dominant contemporary narratives about Appalachia in a new way – how the people of Appalachia have worked and will work to rewrite their own narrative and transcend limiting definitions of what it means to be Appalachian,” said Sally Deskins, exhibits and programs coordinator for WVU Libraries. “Avatars and their Players: From Object to Other,” an exhibit by 2018 award winner Dr. Jaime Banks. 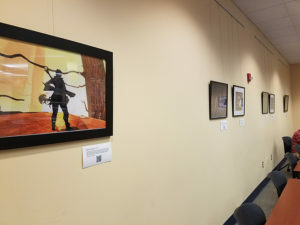 The West Virginia University Libraries’ Art in the Libraries committee seeks submissions for the Libraries’ Annual Faculty/Staff Exhibits Award. The committee invites current WVU faculty and staff to submit ideas for consideration for an exhibit to visually showcase their scholarship in new and experimental ways, providing a visual evolution of their work, visualizing their research and influences, or answering a research question. The winner will receive a $1,000 professional development funds award and an exhibition in Downtown Campus Library, Room 1020. The winner will give a public lecture, program, or demonstration. Non-art faculty or staff may submit a proposal based on their academic research that could become visualized with Library consultation and limited resources. Applicants must submit an outline of their proposal on the Propose an Exhibit online form, with “Annual Faculty/Staff Exhibits Award Submission” in the Proposed Exhibit Location section, by midnight Feb. 28, 2019. More information is available at exhibits.lib.wvu.edu. The 2018 winner was Dr. Jaime Banks, who worked with Dr. Nick Bowman to create the exhibit “Avatars and their Players: From Object to Other,” which visualizes their scholarly research on the experiences and effects of video gamers’ connections with their avatars. It will remain on display in the Downtown Campus Library, Room 1020, through Dec. 30. Sometimes, when processing a new collection of archival materials, you get an interesting snapshot of someone’s life. Occasionally, if you want to know how that person’s story continues, you will have to do some research outside the collection. While processing a new collection, I came across clippings and a few photos of Esther Benford. According to one of the clippings, from a city newspaper, she was a WVU student on track to receive in 1937 the “first degree in civil engineering ever granted to a woman” (probably “at WVU” and not the first in the world, but the article didn’t specify).